As any DiGpuss fans will know, I’m constantly finding things on the Birmingham streets that someone, somewhere once owned. 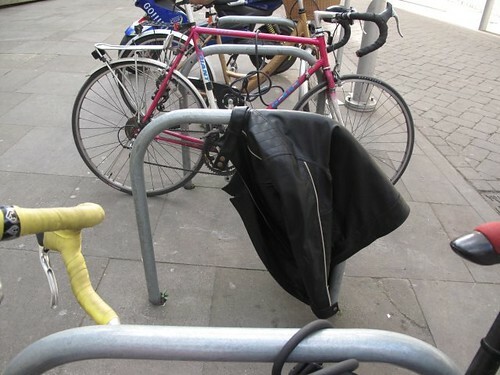 It’s usually discarded, battered tat but occasionally I’ll find something that I suspect its rightful owner might want back, such as the above leather jacket, which I discovered in the Custard Factory after a large event the previous night. I did the right thing and handed it in and, just in case the owner happened to read Digbeth is Good, wrote a post about it explaining where it could be collected from. There are other cases of local websites starting to be used to help with lost and found – take Meowsley, a local website all about cats in Birmingham’s Moseley village. The site seems to be a very amusing, localised version of Kitten War, giving each cat entered a full-feature profile including photograph and scores out of ten for agility, meow, overall cuteness, dignity, etc. When one of these cats goes missing, something interesting happens – a call to action goes out to all the cat-lovers in Moseley to look out for that particular cat. The site even has special email address to respond to in such cases, emergency@meowsley.co.uk. I particularly like their coverage of the disappearance of Didier because readers got to find out what happened – he was found locked in a neighbour’s shed. When people see the start of even a small story like a missing cat, they like to hear the end. Twitter is being increasingly used to raise local awareness of lost and founds pets. Last week Jon Bounds used it to try and find the owner of a small, brown bunny rabbit he found near his Birmingham home. He eventually tracked them down through a neighbour, but I’m convinced I’ll see a lost/found pet case resolved through Twitter very soon. More importantly, this way of spreading the word quickly in your community can be used when people go missing. Last Thursday, Soulla Stylianou’s 92 year-old father-in-law went missing for several hours. She was understandably very concerned and wanted as many people in Birmingham as possible keeping an eye out for him, so posted an SOS on Twitter with a link to a recent picture of him. 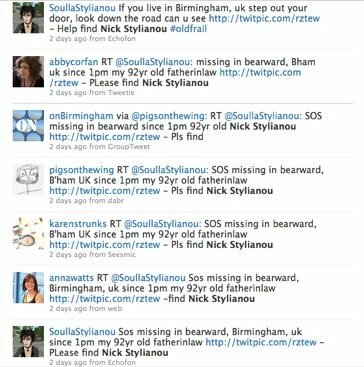 It was retweeted endlessly, including a retweet by Missing_UK, so pretty much everyone on Twitter in Birmingham knew if they saw a man fitting his description, they needed to let Soulla know. Thankfully he was found safe in a local hospital, where he’d been taken after a minor bump to the head, and is now home and well. If you run a local website, think about using it to raise awareness of local lost and founds. 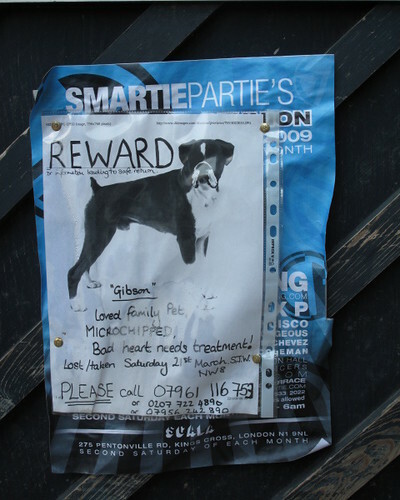 If you see a poster put up by a worried pet owner, take a picture of it and publish it. If your website has a corresponding Twitter account, like the bournvillenews Twitter partner of Hannah Waldrum’s Bournville Village, tweet links to the lost/found post to talk to even more people. The same can be done with local Facebook contacts, groups and pages. You could even create a Lost and Found category or page, so people have a local online port of call. This can be particularly effective on a Forum-style local website or a Ning site, where everyone has equal publishing rights, as the Sheffield Forum have shown with their Lost & Found page. For instance, a recent post about a found dog was viewed 83 times. And if you do start to introduce lost and found features to your site, be sure to satisfy the local interest by letting readers know the end of the story – especially if it has a happy ending, which everybody loves.